Audio company Klipsch has announced that it's launching 10 new products at this year's CES 2019 convention in Las Vegas, including a new family of wireless in-ear headphones, portable speakers, and soundbars. There are four new models of headphones in the lineup, including Klipsch's first true wireless earbuds, as well as models designed for sports and wired versions. Right now we don't know the exact pricing, but Klipsch says prices will range between $59 and $199. Based on current conversion rates, that works out at around £45 / AU$85 to £160 / AU$280. The company says the new T5 range will be available in the next few months, but hasn't revealed whether this applies to all territories. 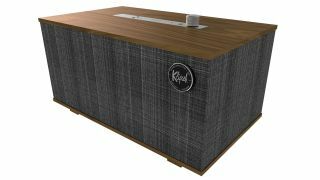 Klipsch is also set to expand its lineup of Heritage Wireless speakers, having recently announced the integration of Google Assistant into The Three speaker. The Three with Google Assistant will have a number of new styles to choose from, including smaller, more portable options. Again, pricing and availability information are vague, but we should see the new speaker styles launch later this year. Finally, Klipsch will unveil five new soundbars, ranging from 40 inches to 54 inches in width. The smallest, Klipsch Bar 40G, will come with Google Assistant built in, while the Bar 48W has even more options, with Google Assistant, Amazon Alexa, and Apple's AirPlay 2. If you're looking for a more immersive cinematic experience, the Klipsch Bar 54A is set to support Dolby Atmos technology and discrete elevation drivers, while bass-heads can opt to buy any of the soundbars with subwoofers. Still, it looks like there's going to be lots for audiophiles at CES 2019 – if you want to keep up to date with all the news and product launches from the tech extravaganza, make sure you bookmark TechRadar's CES 2019 hub, which we'll be updating from the show.